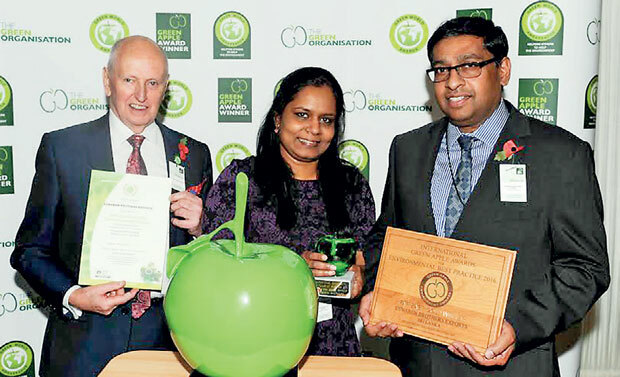 Winning the Gold Award for Environmental Best Practices at London’s Green Apple Environment Award ceremony, Sri Lanka’s most sustainable tea company Eswaran Brothers Exports was ranked alongside the likes of global giants IKEA and Toshiba for its commitment to the environment. As a result of this success, they have been invited to have their winning paper published in The Green Book, the leading international work of reference on environmental best practice, so that others around the world can follow their example and learn from their achievement. With this achievement under their belt, Eswaran Brothers Exports have now been invited to represent Sri Lanka at the European Business Awards for Environment. The Green Apple Awards is hosted by the Green organisation - a non profit committed to recognising, rewarding and promoting environmental best practices around the world, and are supported by the Environment Agency, the Chartered Institute of Environmental Health, the Chartered Institution for Waste Management and other independent bodies. This certification adds to the growing list of milestones in the field of Environmental Sustainability for Eswaran Brothers. In 2010, they became the World’s first CarbonNeutral tea company by entirely off setting the carbon footprint of their operations and also conducted Sri Lanka’s first organisational and product water footprint assessment. They were also the first in the world to introduce a certified carbon negative tea product.